The Blairsville Concrete Products Company (now Blairsville Wilbert Vault Company) was established in 1924 by Les (L.A.) Chick of Blairsville, PA. They began manufacturing concrete blocks. Les was a graduate engineer with much experience in concrete. The company later produced concrete staves for farm and industrial silos until 1934. In 1929, Blairsville Concrete Products manufactured cast stone, also known as dimension stone. In 1945, the company began delivering mixed concrete. In 1925, Blairsville Concrete Products Company began manufacturing burial vaults made from steel and cast iron which they bought by the train carload. Les purchased the Wilbert Burial Vault franchise in 1937 and began manufacturing concrete burial vaults. Having just overcome 3 major surgeries, Les sat in the center of the plant and watched the entire installation of Wilbert equipment. 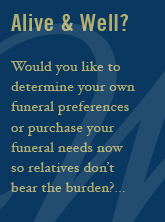 By 1947, the burial vault business represented 80% of the company's total volume of business. As a result of the burial vault business, Blairsville Wilbert was able to ride out the depression. In addition to concrete burial vaults, Blairsville Willbert began to produce concrete slabs for pavement when excess concrete was produced. This became the catalysis for varied additional concrete products. Mr. Chick retired in 1958 to enjoy life on his farm and sold the company to William (Bill) McMillen of Blairsville. Bill had been a member of the Pennsylvania legislature until 1953. His previous business experience is in all phases of the banking industry. Bill is very active in the Wilbert Manufacturers Association (WMA). J DeWayne Dills purchased the company on October1, 1971. Building renovations soon followed along with the growing involvement in the industry. Mr. Dills was elected to the Wilbert Inc. Board of Directors in 1978 and has served on and chaired numerous committees of the board as well as serving as Chairman of both the parent company and its plastics division. Under Mr. Dills ownership, the company has grown to service 27 counties in western Pennsylvania, western Maryland, and northern Western Virginia through five locations and two crematories. DeWayne's son Mark, having grown up in the business and graduating from college, joined the business in 2008. Mark is currently serving responsibility as Director of Marketing.